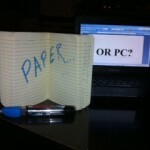 Tom Clempson » Paper or PC? Do you work on paper or on a computer? This is a question that I get asked surprisingly often, and this time I am answering it for myself, to remind me how to write at my best. The answer is – both… and neither. Both. I used have a pattern in writing where I would write my rough draft in a notebook, then the first draft on a laptop. This is great because whilst you are transcribing it you are also re-reading it, and as you are typing, you are also editing and polishing. But as I have said before (probably), I don’t like to stick to rules, rules are too restrictive, so I basically write on whatever I feel like writing on at the time. Neither. Whether it’s paper or computer, it doesn’t really make too much difference to me, because it’s merely a process of putting words in a sequence. But, (and this is the bit that I always have to remind myself about), I would say that about seventy percent of my writing is done on neither paper or computer. If I sit down to start writing a new book, with a blank page or screen in front of me, that’s when I really screw up. I write and I write and I write, then I delete and delete and delete. I seriously have to remind myself over and over again that just because it’s called ‘writing’ it doesn’t mean I have to be physically putting words onto a page to be doing it. Nearly all of my first book was written entirely in my head, without a piece of paper or a laptop in sight. In fact, sometimes just the pressure of having a blank page in front of me is enough to make my creative juices completely dry up! For me, one of the toughest parts about writing is finding the time to do it, but that needn’t be as big a problem as I make it out to be. When I wrote my first book I did most of the ‘putting words on pages’ on the train to and from work, or in the evenings when I got home, but most of that was really just a process of taking the book that was in my brain and putting it onto paper. The actual writing was done in between, in my head. The real answer is this – paper or PC really doesn’t matter to me, I prefer to write in the shower, cooking dinner, walking around shops, doing the washing up, driving into work… Constantly coming up with ideas. For me to sit down at a blank page and try to write a story is like setting off on a trip to blackpool, or Glasgow, or Cornwall or anywhere else I’ve never been, without looking at a map first of all. Sure, it feels like an adventure, but ultimately I’m going to get lost and probably never actually get to where I wanted to go. So, I now have no excuses. No excuse to not get writing done, no excuse to not do the washing up, no excuse to not make dinner… What the hell am I doing??!!!! Forget everything I just wrote. 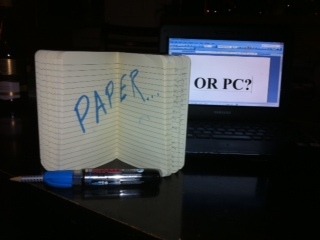 I prefer paper.